JONATHAN TSE CD + DVD ALBUM LAUNCHING: 21st OCTOBER 2012. The launch will be held in BED Club, Waterfront at 9pm with guest appearances by local artist such as JADE sisters (a mesmerizing vocal girl group), D+A (newly formed rock trio band with a tight groove), Take Cover Band (a lively band that has been in the industry for more than 10 years). Jonathan Tse will also be performing some of his songs from his new album and selling his CD+DVD package, which also includes a free poster. The ‘An Evening with Jonathan Tse Live at Refuge Studios’ CD+DVD album is to celebrate Jonathan’s 5th year in the recording industry. Part of the proceeds from the sales of the album and merchandise will go for charity to Jireh Homes, Tuaran. to raise funds for Jireh Home, Tuaran. Jonathan plans to hold COLOURS annually with the objective of charity for children. The theme ‘COLOURS’ means to bring colour to the lives of the children that have been abused, neglected or just in need for care and love. COLOURS will be held at Papayas Beach Lodge, Labuan from 4-9pm. The artist that will be featured in this concert would be Juwita Suwito (world known singer/songwriter, vocal coach for Malaysian Idol, owner of FourForty Records), Roger Wang (international finger style guitarist), JADE Sisters (vocal girl group), Peter Lau (drummer/inventor), Simon Lau (bassist) and Jonathan Tse himself. Ticket for the event is RM100 (for those above 12 years) and includes a RM20 food voucher. 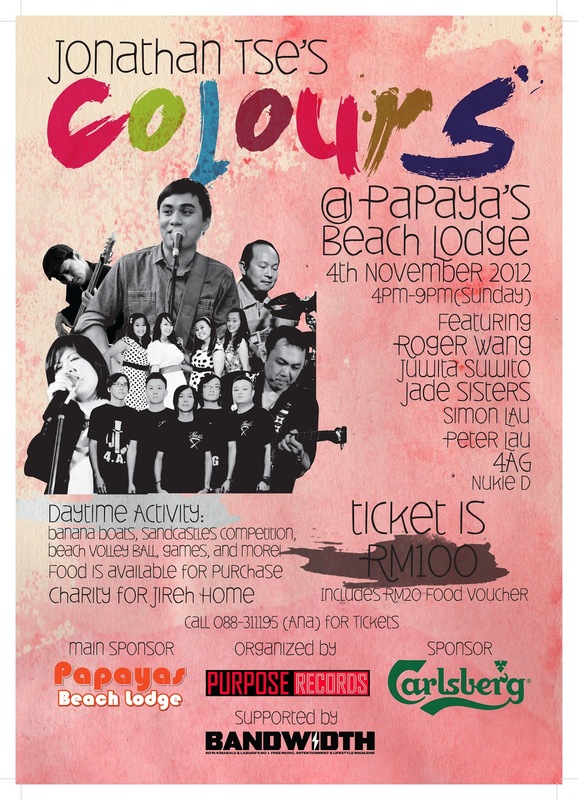 The COLOURS CHARITY DAY OUT will include games such as sandcastle making, banana boat, volley ball, etc. All proceeds from ticket sales will go to Jireh Home. Part of the proceeds from food sales will also be for charity. Jonathan Tse is a Malaysian singer-­‐songwriter and music producer with songs inspired by faith, love and hope. Highly energetic and contagious, Jon’s songs will keep your feet tapping to the groove of the music. He also runs PURPOSE RECORDS, a recording label in Malaysia and owns a professional recording studio (REFUGE STUDIOS), a music academy (REFUGE MUSIC ACADEMY) at Kota Kinabalu, Sabah in Malaysia and a music, entertainment, lifestyle magazine (BANDWIDTH MAGAZINE). Jonathan also devotes his time to the youth work at this church and travels extensively to speak to young people and share his music.You can get his songs from online stores such as itunes and Amazon. Jonathan has performed in various venues across Malaysia, Philippines, Singapore,London, Australia, and also at the KK Jazz Festival 2008 & 2009, Penang Jazz Festival 2010, Rock & Jazz Asia City, BB Pesta Concert, and many more.